The University has signed a one-year deal with digital advertising agency Tribal New York, its biggest marketing move since overhauling its messaging and redesigning its logo over the past two years. 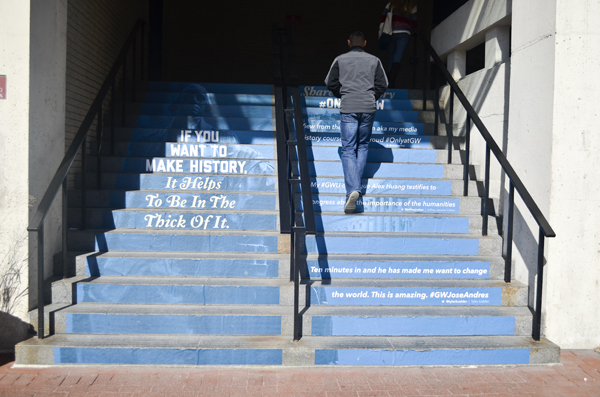 Last year, GW pasted "#onlyatGW" tweets on the stairs leading into the Marvin Center, highlighting D.C. connections as the University prepared to launch the $1 billion campaign. A New York-based advertising agency will spend the next year creating digital communication campaigns across the University – the first time GW has hired a firm to focus on its digital presence. Tribal New York will try to bring attention to the University’s graduate programs, said Vice President for External Relations Lorraine Voles, a focus that comes after graduate enrollment shrunk in most of GW’s schools last year. The agency has already started making digital advertising plans for Lisner Auditorium and nearly all of GW’s schools. Voles said Tribal New York will help the University target prospective students who work in certain areas like human resources on LinkedIn, making it easier to connect with people who could enroll in GW’s graduate programs. “Tribal is developing digital advertising plans that can target our prospective graduate audience population more effectively than through traditional forms of advertising,” Voles said. Voles said the partnership would be more “cost-effective” because schools will often only pay for the advertising if people click on the ad. GW will pay the firm a percentage of the advertising dollars it spends, though she declined to provide specifics. Tribal New York did not return requests for comment. Matt McDermott, the creative director at the Baltimore ad agency Idfive, said more schools are looking to outside agencies as students apply a larger number of schools. His firm has planned advertising campaigns for Johns Hopkins University and the University of Baltimore, he said. “Schools are realizing that [there is] vicious competition out there for students these days. At some point, all schools are fishing in the same ponds. I think a lot of traditional schools are finding it really important to be efficient in their marketing approach,” McDermott said. The partnership comes about two years after the University redesigned its logo and about a year since officials overhauled GW’s marketing to focus on its downtown D.C. location and build excitement for the launch of its $1 billion campaign. Derek Rucker, an advertising and marketing professor in the Kellogg School of Management at Northwestern University, said it is “not uncommon” for schools to hire outside agencies for advertising and reaching potential students. An agency can also help a school craft unique messages for each of its colleges or programs, Rucker said. “Different programs could have different target audiences. You wouldn’t want necessarily the exact same copy for each group. That’s a very strategic move. You want the agency to be well aligned with what each different segment wants and needs,” Rucker said.